In my first lecture I talked about the nature of legal and political legitimacy for a constitution. I then traced through Canadian history something of the quality and location of these forms of legitimacy in the development of our own constitution. I suggested that from Confederation until 1982 the source of legal legitimacy has always been seen as the United Kingdom Parliament. On the other hand, the source of political legitimacy has shifted somewhat. In 1867 the country was thrown together without direct consultation of the population and without specific approval from any of the colonial legislatures for the final Confederation scheme. A good deal of the political will actually came from the government and Parliament of the United Kingdom. During the rest of the nineteenth century, however, it became clearly established that political legitimacy for further constitutional change would have to be found in Canada. 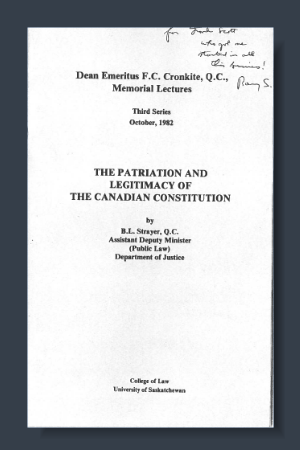 In the twentieth century it became further accepted that political will in Canada for constitutional change would have to come not only from the Government and Parliament in Ottawa but also, in some cases, from provincial governments and possibly from provincial legislatures as well. That is highly misleading; no doubt, deliberately so. The so-called “appeals” from the “three provincial courts” were non-judicial provincial advisories. Like the so-called “patriation reference” “appeal” itself, they were non-binding, having no declaratory value since they were all non-judicial. When discussing the Supreme Court [capital “S” and “C” for the pre-1982, pre-coup Supreme Court], sitting on advisories, a good rule of thumb, so as not to get confused between the legal and the illegal, between courts and other types of bodies such as advisory boards, would be to refer to the judges when they sit as a board, by the provision of the Supreme Court Act purporting to set up the board. In the case of the so-called “patriation reference”, they would then be called “the Section 55 board”. And I say purporting, because the jurisdiction is unconstitutional, and those like Trudeau, who have abused it, know it. And so do their pet professors who write the law journal articles on the “utility” of references, etc., in order to “cover” it for them. In sum, it would be preferable, in the course of critiquing and researching these matters, to refer to advisories, both federal and provincial, as conducted by “boards”, not courts of law. Furthermore, emphatically, the validity of a “process” is irrelevant if there is either no underlying power to conduct a process, or the power to do so is withheld. This is the case in Canada regarding “secession” on the one hand, and the “patriation” package on the other that was tricked through by the particular ruling junta. Click above to read a scan of the original online. Download a scan of the original. Download a searchable OCR made from the scan. Download selected quotations from the Strayer Lectures. 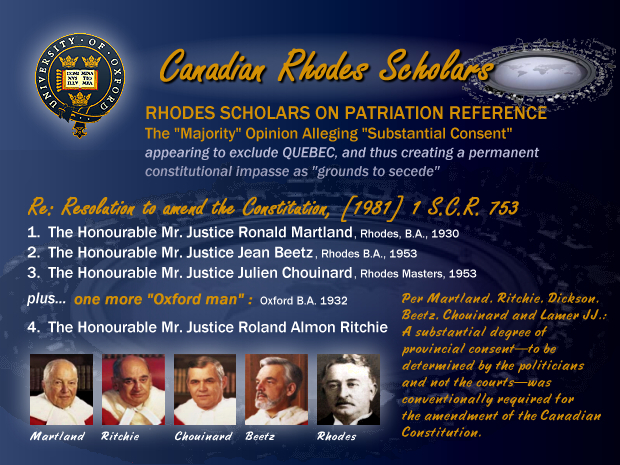 Canadian Rhodes Scholars on Patriation Reference were a front to cover a Parliamentary and Constitutional coup d'état. -- Leon Trotsky, at p. 56 of Chapter 4, "Terrorism", in "Terrorism and Communism - A Reply to Karl Kautsky by L. Trotsky", i.e.,The Defence of Terrorism, 1921, The Labour Publishing Company, London. The paradox of conquest is that a successful conquest is one that negates its own animating principle. In order to prevent future conquests, successful conquerors must find a way to represent their conquest without sanctioning the principle of violent change as a permissible way to transfer political authority. Machiavelli’s solution to the paradox of conquest is found in his admonition that the conqueror “appear ancient”. Conquest, in other words, is irreducible to brute force; it involves the production of appearances, of signs, and of symbols. ... [Scholars] have pointed to the significance of signs and ceremonial practices, both as a way of overwhelming the enemy and as a way of generating authority deemed legitimate." -- Yves Winter, writing in "Conquest", published in Political Concepts, a journal of The New School for Social Research, NY, NY, 2011. This work all comes out of my own pocket. Please support the ongoing research at this web site, if you can. Thank you.